The Celebration at Chicago proved to be a good one. But for the 20th of Celebration, it seemed a little… sparse. There was certainly a celebration of The Phantom Menace, but aside from its beginnings there seemed little about Celebration itself. It also doesn’t help that this year there seemed less going on during the livestream. It seems bad to say so, but it felt like Anaheim in 2015 – the first Celebration to have a livestream. Panels that would have been entertaining to watch were missed out even with large gaps of roughly two hours where they could have easily slotted in. The interviews with the guests were good to listen in on, but there were times where they were recapping events we had just seen. Of course, this could just be me missing the spectacular amount of panels they managed to squeeze into the livestream of Orlando in 2017, but then – that was the 40th of the entire franchise. Even if there was just one more panel per day, I’d have been happier. The content we did get was good, however. The Rise of Skywalker looks to be a solid end to the trilogy. The Mandalorian sounds like it’ll be a great addition to the franchise when it arrives on Disney+, but The Clone Wars inches ahead slightly in terms of excitement. Resistance I haven’t seen much of, but I’m hoping it comes to Disney Life soon so I can watch it with few breaks. And I'm sure when the second season comes to the UK I'll be waiting to tune in. I have to mention Jedi: Fallen Order, and how I hope it lives up to the expectations people have. This will be the first true single player game since The Force Unleashed 2 back in 2010. From what I can see, it should deliver from a character standpoint, but it’s the gameplay that really needs to stand out. Respawn have been behind the Titanfall series, which has solid mechanics, so I’m hoping the same feeling of fluid movement is present with this title. There were a number of things not on the livestream – that never make it onto the livestream. The novels and comics and other books of the franchise. Just as with the last two films of the sequel trilogy, The Rise of Skywalker will also be getting a Journey to… series, with more info to be revealed. I’ve got all the novelisations of the films, so The Rise of Skywalker will be another grand addition to my collection. Whether I take to any of the other books in the series depends on the focus. In terms of what has been revealed, we at least have some info on the Age of Resistance comics. We’ll see Finn as he was before The Force Awakens, Rey and Chewie will have their journey to Ahch-To documented, with Phasma, Hux, and Poe also getting their own books within the series. There will also be Age of Resistance specials, with the first seemingly focusing on Admiral Holdo. I’ve been out of the comics for a while, having started on the main series and picking up a few others, but I might just come back to see what these are like. Of course, I couldn’t be ending this without talking about Galaxy’s Edge. There’s a huge focus upon that Black Spire Outpost, with several books coming to reveal more about it. A Crash of Fate will be one of those, with the cover being shown off at Celebration. The five-issue comic series called Galaxy’s Edge will feature Dok-Ondar as he appears within the park, with a focus on his possession of some of the antiques available from it. How Black Spire Outpost appears in the series is “impossibly accurate” to how it will look at the park. As for the park itself, it would be amazing to be able to go and visit. To feel as though I’m really inside a part of the Star Wars universe. And since Celebration is returning to Anaheim in 2020, would it not make sense to hold an exclusive event within Galaxy’s Edge for those at Celebration? If I could, I would absolutely go even if there wasn’t such an exclusive event. After all, tick two dream events from the list in one holiday. I’ve always said at the end of covering Celebrations that I’d love to go to one, but such a dream has not yet become a reality. Being within the event and meeting all the guests and making new friends and just feeling the energy such an event brings with it. Revelling in the moment to moment interactions, and taking in the whole of what Celebrations offer. It has been a good one, Chicago, but I have a feeling that Anaheim 2020 will be a big one. The final day certainly felt like the final day. It was a day of looking back and the final celebration of many 20s. The Phantom Menace, Resistance, and the Closing Ceremony all took the time to look back at all the fun that’s been had with various aspects of Star Wars, and at the end of the day the announcement of the next. The Phantom Menace panel took a look back at the film, with some of the production staff coming up to talk starting out, creating the effects and designs, and working together to bring these worlds and characters to life. As well as their favourite moments of working on it. There’s a good number of things said during this half, with two of those on stage talking of their cameos within the film. Ian McDiarmid and Ray Park get on stage to talk landing the roles, crafting the characters, and stories from the set. Ray Park talks his cameo as a Naboo guard and both talk about the fan reaction to the characters. Ahmed Best and Anthony Daniels join them to discuss the same things. As ever when Anthony and Warwick get together, there’s friendly jesting at every opportunity. The start of Celebration is also talked about, with a few stories of that first event that both Ahmed and Anthony were a part of. The production staff are brought back and a message from George Lucas is played. Warwick thanks those people on stage by recognising their accolades from The Phantom Menace and beyond. Except for Anthony at first, who Warwick pretends to have forgotten. Ian McDiarmid talks fan reaction to the laugh at Rise of Skywalker, a bit about getting onto Rebels, and how this evil dude is universally loved, and James Arnold Taylor riles the fans up with a “Hello There”. There’s also a Dianoga cosplayer around. The Resistance Season 2 panel starts by bringing all the guests out and starts from the beginning of the show during the first ideas of it. The actors talk characters, and are even so like them that it comes across in their actions. They also talk about recording sessions. Talking favourite episodes of the first season and the season as a whole, they then move to discussing the second. That we on the livestream don’t get to see. Warwick Davis hosts the Closing Ceremony panel, starting by checking in with the other stages for highlights of the events. On the Star Wars Show stage, members of the 501st Legion come out to honour the contributions of Andi and Anthony to the Star Wars community by making them honorary members of the Legion. The Galaxy stage gives their thoughts, with a clip from the Star Wars Let’s Play panel that looked a riot. I’d have really wanted to see the entire thing. They thank the crew that put the entire Celebration together. Back at the Celebration stage, Warwick talks about the panels that happened there. 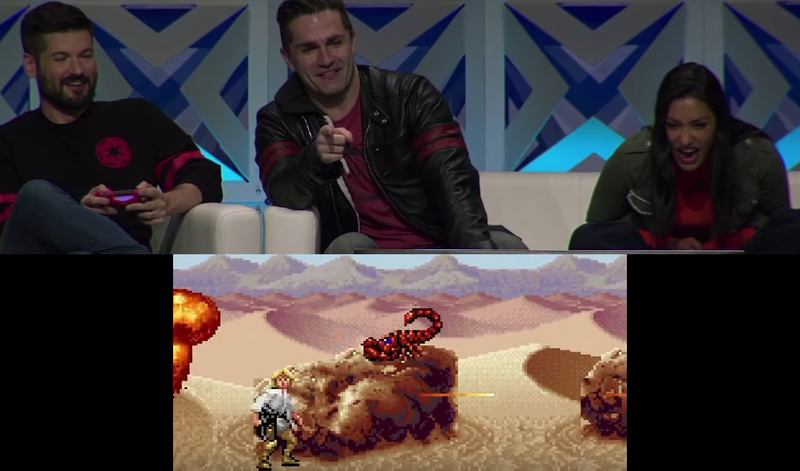 He shows The Clone Wars trailer again upon reaching that panel. He saved The Rise of Skywalker for last and rolls that trailer again. A highlight reel of what’s been happening over the four days was played, showing the community spirit of the fans. To announce the next Celebration, they do a recreation of the hallway scene of Rogue One by including the fans at the panel by having them pass a giant datachip and lightsaber in a race back to the stage. Anaheim 2020. For the last word, Warwick gives a big shout out to the people that help organise the Celebrations and run them, that the fans have had a great time and made plenty of memories, and thanks again the people on the other stages. It’s then back to the Star Wars Show stage to thank the fans, crew, and builders of the sets around Celebration, and fire off the T-Shirt cannons one last time – filled with celebratory confetti. It’s been a great ride, and a lot of fun watching from home. I’ll have one last post giving some final thoughts, so be sure to check that when it comes. Day Three was set to be my favourite of all the days with just those three words. The Clone Wars. And that panel was a great one. There were plenty of things to see from the show floor and the guests, and the continued celebration of The Phantom Menace continued with an interesting look at its design. The Mandalorian had Dave Filoni and Jon Favreau talking about how they met and the project got started. Pedro Pascal, Gina Carano, and Carl Weathers are brought out and talk turns to introducing their characters. Those at the panel then got to see some footage that lasted three minutes based on the timer that those on the livestream got to see. A story of working with the 501st Cosplayers is shared, behind-the-scenes of building props is shown – including the ship that The Mandalorian uses – and using the miniatures in flight tests. I couldn’t fully enjoy this panel, though – because Youtube would not stop erroring within every minute! There were some interesting other facts shared about production thanks to some Twitter questions, though I barely got to hear any of it thanks to that issue. The Star Wars Show livestream started up with no errors appearing at all, so why it was messing me around with that panel I have no idea. The guys that hosted the Toys That Made Us Netflix series appeared to talk about the Star Wars episode. It’s certainly a time for twenty years of plenty of Star Wars things, as Lynwen Brennan celebrates twenty years as LucasFilm, and she joins the Star Wars Show stage to share the story of joining the company and why she remains with them. The next panel shown was Doug Chiang: The Evolution of Star Wars Design, looking at the process in designing for the prequel trilogy. He shares how he pushed himself to improve in all aspects of design for a year and finding his own style before sending it all to LucasFilm and finally landing the job of design director. Then working with George Lucas to develop the feel for the prequel trilogy, and the influences they worked with. He revealed a load of concepts, including a wall of shame of rejected ideas. How ideas that don’t work in one place can always be used elsewhere – such as a Neimoidian concept becoming the Geonosians. How the droidekas came to be. The designs being translated to 3D models and being used in production. The panel proved a very interesting look at building the world of the prequels, with a section on the podracers and constructing the unique look of them, as well as the course of the race. 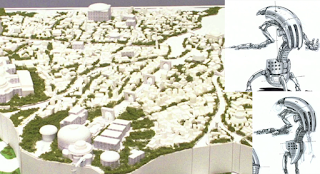 The creation of Theed was also covered, with an entire model of the city created to map it all out. It’s amazing to see the process of all this work and the rules that were laid out to aid in its creation. The three actors who appeared for The Mandalorian panel took the stage to talk, allowing me to finally hear the things I’d missed out on. The three characters certainly sound like they have their place within this world, and their interactions are sure to be great. 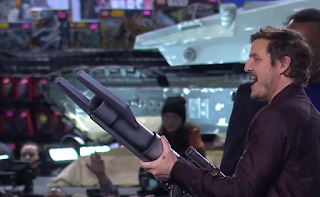 The T-Shirt cannon got an upgrade to be stylised after The Mandalorian, and these three actors got to fire it first. I think the return of The Clone Wars is my most hyped panel, and it gave a great look at what’s to come. Dave Filoni, Ashley Eckstein, Sam Witwer, and Dee Bradley Baker are on stage to talk the new season. Dave Filoni starts it off talking about how it came to be that we are getting the new season and getting it done right. The cast members talk about returning to the show and finishing it. Ashley and Dee reveal how she found out through a text conversation with him. Sam brings up the Siege of Mandalore and how they only had as much as they needed to during the meeting of Maul and Ahsoka and how he found out that they’d be returning to that story. The Bad Batch arc is confirmed, with this being the closest to the old feel of the show – which has seen some evolution to use the new technology. A clip is then shown of the arc where the Bad Batch is storming a line of droids. Ahsoka is shown with a change to bring in some of that Rebels design, with Dave talking about finding herself now she’s left the Order. 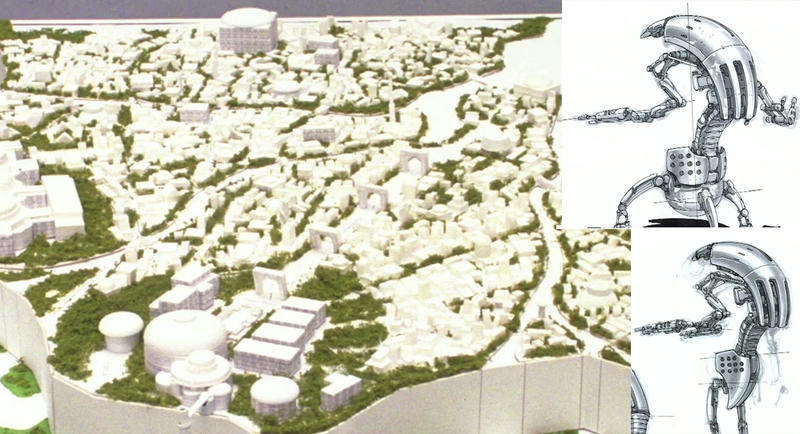 1313 is mentioned as a place where she meets two sisters, and that is another story arc shown with another clip of how she ends up down in the lower levels of Coruscant. Then we get to the Siege of Mandalore. It had to be done right. It’s one of the most important arcs for a number of characters and a pivotal point of an entire culture of people. Maul has seen a redesign to look similar to his appearance in Solo. And for Maul, it’s a very important arc, as Sam talked about. The sketches of the arc are shown that’d we’d once seen from the Untold Tales panel from a past Celebration. They wanted the best lightsaber fight of the entire series, so they got Ray Park into a mocap suit to create it. And then the final clip, that while not final animation, is pure emotion. More of The Clone Wars cast are brought out to the stage, giving Matt Lanter, Mathew Wood, James Arnold Taylor, Catherine Taber, and Tom Kane a chance to talk about coming back to the show, and they revelled in being back together. Dave gives a shout to George Lucas and the mentorship he received from the master. Then… the full trailer. And… just magical. There’s so much to these three arcs that’s being hinted to. And that opening of the final moments of season five just really hit hard that we’re really getting the true end. Janina Gavankar gives her thoughts on Jedi: Fallen Order and about Iden Versio and the fan reaction to her, a marriage proposal happens on the Star Wars Show stage, and there’s talk about audio and dubbing action scenes with many people with Mathew Wood. Sam Witwer and Matt Lanter also join the stage for talk on The Clone Wars with a bag of sand cosplay in the crowd. Tom Kane talks getting the job of voicing C-3PO, Yoda, and other characters within Star Wars. Three days and a lot of great behind-the-scenes talk and some amazing reveals. With one day remaining, there’s still a lot of great things to come.